Why is my add-in crashing? If you get a message similar to the following, we recommend you disable the add-in to prevent future crashes and also get a newer version of the add-in so it works correctly using Data Execution Prevention (DEP). Word experienced a serious problem with the ‘dep exception on startup add-in’ add-in. This add-in is incompatible with Data Execution Prevention mode and should be disabled or upgraded to the latest version. Do you wish to disable this add-in from loading? Note: Some crash notifications aren’t DEP-related. When an Office program restarts after a crash, you should see a message about why it crashed. Introduced in Microsoft Office 2010, Data Execution Prevention (DEP) helps prevent badly-written code from running and harming your computer. When an add-in that isn’t designed to function in a DEP-enabled environment tries to run, the Office program you’re using stops working (crashes) to help protect your computer. Click File > Help > Options > Add-Ins. In the Add-Ins area, select the add-in you want to learn about. Information about the add-in appears in the Description area. The Description tells you if the add-in was disabled by DEP. Tip: You can also enable the add-in in this area. Add-in is incompatible with Data Execution Prevention The add-in failed the DEP process and is disabled. Add-in was disabled by the user after the Data Execution Prevention The user disabled the add-in, after an error occurred. In Office 2010, you can turn on or off DEP in the Trust Center. But Office 2013 has been updated so this feature can’t be turned off. But we don’t recommend you turn off DEP because DEP helps protect your computer. Note: Data Execution Prevention is available in 32-bit and 64-bit versions of Office. 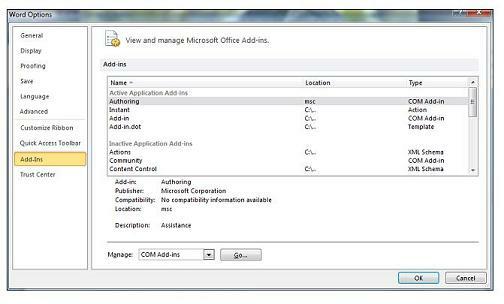 In the 32-bit version of Office 2010, there are Trust Center options you can view or change, but there are no Trust Center options in the 64-bit version. In the Trust Center, click Protected View. Under Data Execution Prevention, check or uncheck the Enable Data Execution Prevention mode box.